Progressive, fun, language immersion programs for younger children, from 6 months to 3 years of age. 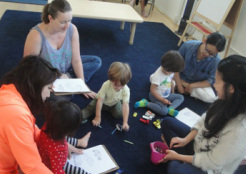 Our Parent 'n Me classes incorporate songs, art, creative play, and story time, while teaching children the basics of the target language (family, shapes, colors, and simple daily interaction). A special emphasis is placed on teaching children basic manners, how to share and interact with their peers, and an increasing level of self-sufficiency with daily tasks. Research shows that brain development in young children is more complex and more receptive to life-long language acquisition when exposed to the sounds and tones of a second language at a young age. Classes are taught in a pure language immersion format. Parents or care takers are encouraged to stay and participate in our Preschool Prep classes.